Governor Jerry Brown has granted 38 people pardons just before the Thanksgiving holiday, including a former California state senator convicted of voter fraud. Wright is one of the 107 people receiving pardons or commutations on Nov. 21, 2018. Among the recipients are many facing possible deportation with one man who lost his home in the recent Camp Fire disaster. In 1972, Roderick Wright was sentenced one year, six months’ probation for taking a vehicle without the owner’s consent. Wright was elected to represent the 48th Assembly District in California Assembly from 1996 to 2002. Later, he represented 25th Senate District from 2008 to 2012. 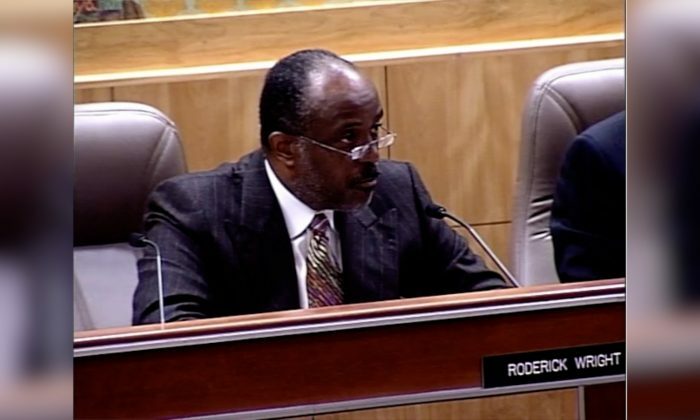 In 2010, Wright was accused of living in Baldwin Hills, roughly five miles outside the Inglewood-area district, which he was elected to represent. Despite his argument that he had followed the law and established domicile at the Inglewood property, where his stepmother was renting a unit from him, Wright was still convicted of five counts of fraudulent voting, two counts of perjury by declaration, and one count of filing a false declaration of candidacy in 2014. Wright resigned from the State Legislature after being sentenced to 90 days in jail, three years probation, and 1,500 hours of community service. He surrendered to the Los Angeles County jail in November 2014 but released after about 90 minutes due to the crowded condition of the jails. In the wake of Wright’s conviction, the State Legislature passed SB 1250 this year allowing lawmakers to effectively live outside of their districts, and protecting them from prosecution based on primary residences. The governor’s pardon came as a result of Wright’s “good moral character,” and his law-abiding example after being released from custody, according to the pardon. According to the Sacramento Observer, Gov. Jerry Brwon has so far granted 1,593 pardons during his serving period, making him the governor issuing the highest number of pardons and commutations in state history. However, Gov. Brown’s pardons has also raised concern from a public interest organization. The First Amendment Coalition (FAC) announced on Nov. 20 that it had filed a motion in the California Supreme Court to unseal records regarding Wright’s pardon. “The Wright records are just one example of several dozen recent cases where the governor had sought to pardon people via a process that results in large numbers of documents being automatically filed under seal at the state’s High Court,” the FAC wrote in a statement. Compared to Gov. Brown from 1991 to 2010, former governors Pete Wilson and Gray Davis didn’t grant any pardon while Arnold Schwarzenegger only issued 15.